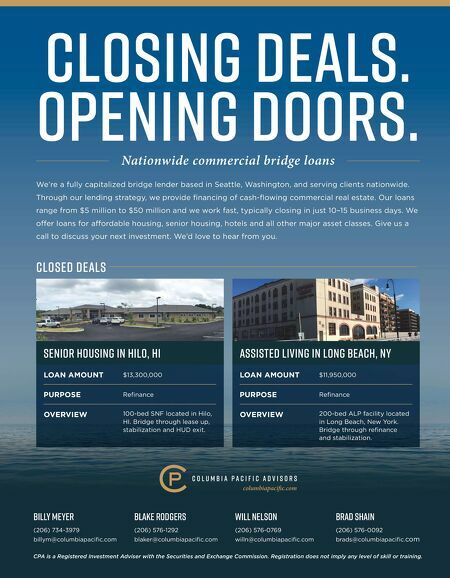 Editor's Letter 6 www.seniorshousingbusiness.com Seniors Housing Business n October-November 2017 When it comes to development and investment prospects for 2018, seniors housing is head and shoul- ders above all other residential property segments, according to Emerging Trends in Real Estate, an annual forecast survey compiled by PricewaterhouseCoopers (PwC) and the Urban Land Institute (ULI). That's a big vote of confidence in seniors housing, which bested affordable apartments, moderate- income and high-income apart- ments, and even student housing in the latest survey. Emerging Trends notes that investors are attracted to seniors housing for several reasons: • Compelling investment returns — Institutional-quality, private pay seniors housing has consistently produced steady income and strong returns for more than 10 years, reg- ularly beating apartments, retail, offices, industrial and hotels. According to the National Coun- cil of Real Estate Investment Fidu- ciaries (NCREIF), the total return for seniors housing in the first quarter of 2017 was 12.05 percent compared with 7.27 percent for the NCREIF Property Index (NPI), which tracks apartments, hotels, industrial, office and retail. On a 10-year basis, total returns for seniors housing sur- passed the NPI by more than 400 basis points. • Enticing demograph- ics — Growth in 82-to- 86 age cohort, which dominates assisted living and inde- pendent living properties, starts to accelerate this year and will gener- ally continue to do so until 2025. Between 2017 and 2025, this age cohort is projected to increase from 5.1 million to 6.6 million people. • Post-acute care coordination opportunities — Alternative pay- ment plans and networks, such as accountable care organizations, managed care organizations and bundled payments, are displacing fee-for-service payment plans in both Medicare and private health plans. Seniors housing operators, as well as skilled nursing and post- acute providers, have new opportu- nities to become part of the emerg- ing care continuum. In short, the stars are aligned for the senior living industry. An emerging investment darling Matt Valley H O U S I N G B U S I N E S S ® SENIORS Seniors Housing Business® (ISSN 2168-9199) is published six times per year by France Publications, Inc., d/b/a France Media, Inc. Editorial and advertising offices are located at Two Securities Centre, 3500 Piedmont Rd., Suite 415, Atlanta, GA 30305. Telephone: 404-832-8262. E-mail: seniors@ francemediainc.com. Postage paid at Atlanta, GA, and additional mailing offices. POSTMASTER: Please send address changes to Seniors Housing Business, P.O. Box 47065, Plymouth, MN 55447-0065. ©2017 France Publications, Inc. Seniors Housing Business® is a registered trademark of France Publications, Inc. Subscription rates: USA 1 year, $78; 2 years, $112. Single copies are $15. The opinions and statements made by authors, contributors and advertisers to Seniors Housing Business are not necessarily those of the editors and publishers. To photocopy items from Seniors Housing Business in quantities of 100 or less, authorization must obtained from and a fee paid to the Copyright Clearance Center, 222 Rosewood Dr., Danvers MA 01923. Telephone: (978) 750-8400. For quantities of more than 100 or for PDFs, please contact Barbara Sherer, manager of special advertising at 404-832-8262 or bsherer@ francemediainc.com. For subscriber services, please call 1-800-869-6882 or write to: SENIORS HOUSING BUSINESS Customer Service Department P.O. Box 47065 Plymouth, MN 55447-0065; e-mail: SRHB@kmpsgroup.com Or visit www.seniorshousingbusiness.com/subscribe Chairman and CEO Jerrold France President Scott France Chief Financial Officer Michael F. Jacobs Senior Vice President, Editorial & Operations Randall Shearin www.francemediainc.com Publisher Richard Kelley (914) 468-0818 rkelley@francemediainc.com Media Advisors (404) 832-8262 Eric Goldberg egoldberg@francemediainc.com Andrew Johnson ajohnson@francemediainc.com Ryan Nixon ryan@francemediainc.com Editor Matt Valley (404) 832-8262 mvalley@francemediainc.com Managing Editor Jeff Shaw jshaw@francemediainc.com Contributing Writers Jane Adler Lynn Peisner Published by France Media, Inc. Vol. 6, No. 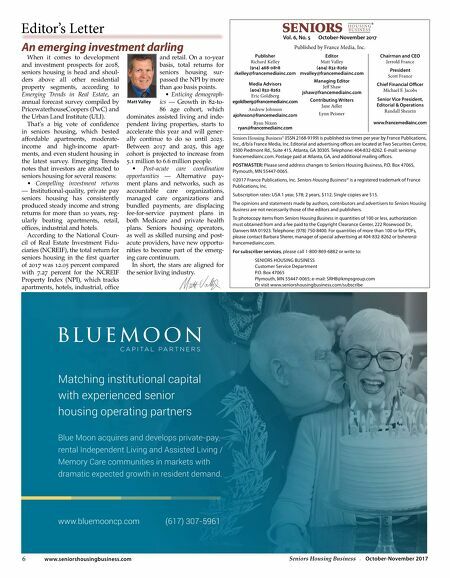 5 October-November 2017 www.bluemooncp.com ( 617) 307-5961 Matching institutional capital with experienced senior housing operating partners Blue Moon acquires and develops private-pay, rental Independent Living and Assisted Living / Memory Care communities in markets with dramatic expected growth in resident demand.